I had my fantasy baseball draft this past weekend with all my buddies from high school. There are some of us who view the weekend as a way to put the vast amounts of time spent pouring over baseball stats to good use. They do the homework, crunch the numbers, and come ready to formulate a team. I was NOT prepared. Nevertheless, I'll be the first to admit - the real reason we trek back to our high school stomping grounds for a day long draft is so that we can act like we did when we were in high school. It's an annual ritual. An opportunity to relive pseudo glory days, regale with old stories, and laugh like we hadn't heard them 100 times before. The only difference is we have larger waists, less hair, higher tolerances, and better taste in beer. My friend, Bill, graciously hosts us every year. His wife, Kelly, is understandably less than thrilled, especially since this year, they have a NEW house. Fortunately, their place is big enough (10 times the size of mine, double the price) that come bedtime, it's unlikely they could hear even the loudest of the group. At least, I hope. So, as the draft progressed and those of us who hadn't memorized Johnny Damon's OBP or Chris Capuano's WHIP began more frequent visits to the keg. Well, it just happened. Someone (read: me) bounced a quarter off Bill's stealth-bomber shaped island kitchen counter. The familiar tink had a Pavlov's dog effect, and heads instantly turned. Game on! After the ensuing three hours of speed quarters came to an end, I looked around and couldn't help but think of high school and surveying friend's homes after parties. Pizza boxes, open chip bags, and the quintessential red plastic Solo cups strewn everywhere. There had been 12 of us. Looking at Bill's place, you'd think at least 50. Yesterday, still a dull thud in my head (what can I say? 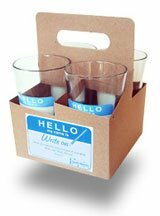 I'm no spring chicken), I ran across this post about Hello Pint Glasses on Lifehacker. These would have been great for keeping the mess at Bill's and our drunken attempt at cleaning to a minimum and probably would have helped in preventing us from catching the same cold. More importantly, they would have been perfect height for our speed quarters game's Super-Challenge shots. Which If I'd made, I wouldn't have had to lap Bill's neighbor's houses in 38 degree weather. I read about Meetup on this Lifehacker post and thought it was interesting. Basically, it allows you to create/join clubs and social groups with common interests. You can either search based on city or interest. They've been mentioned in Time, Fox News, and The Economist. All day yesterday I caught myself whistling their jingle. I was genuinely looking forward to it. I mean, come on. Basketball tricks and slapstick comedy? Two fun things. Put them together and ka-blamo, you got yourself an evening full of family-fun hijinks. Buckets full of confetti and the opposing team getting pantsed to the point of indecent exposure. Ahh, the nostalgia was palpable. Nevermind that I had the nagging thought that the Globies must be having some rough times to be booking such soup-line-esque gigs. Ethan and I were walking up to the school and there it was by the entrance, the tour "trailer." Imagine my surprise and disappointment when I saw the words on the side, The Harlem Wizards - Trick Hoops and Alley Oops. Who the hell are these posers? It turns out that Kerry wasn't exactly wrong. A couple of the guys are former Globies (or, ahem, have been loosely affiliated with the team at some point in time). The rest of them seem to be NCAA-flunkies who thought they were going to The Show, and therefore, never bothered getting an education. Sorry, that's too harsh. I'm sure the Wizards do a good job and probably help lots of organizations raise hundreds of dollars. Good on ya', Wizards! But I still couldn't help but think that we were watching a really bad copy, like in that Michael Keaton movie, Multiplicity. Remember, Doug #4. Yeah, I like pizza, too, Wizards. The whole surreal experience made me curious. So I went to their website, and you'll be happy to know that the Harlem Globetrotters are still around and doing well. "Curly" Neal has long since hung up his Chuck Taylors, but they're still entertaining families across the globe on their 2006 "Unstoppable" World Tour. So, Kerry's at church on Sunday with the kids and our seven-year old niece, Caroline. The priest usually invites the children of the congregation to join him up front during the homily, and Ethan and Caroline go up. The priest begins by explaining to the kids that Wednesday is a very important day for the Church. Priest: Do any of you children know what the special day is? Priest: Well, you're right it is March 1st. Does anyone know what the special day is for the Church? Anyhow, the priest goes on to explain Ash Wednesday and how it's the beginning of Lent. At the end of the homily, he asks the kids to return to their seats. Ethan and Caroline come back to the pew. Caroline: (to Kerry) Wasn't it funny when Ethan made the whole church laugh?